I was sitting around the other day, tossing around some ideas for new and exciting dishes. Dishes that were new but still good stand-bys. One of the first dishes that came to mind was my friend James’ twice baked potatoes. I have not had them in years but I remember them fondly. He would never share the recipe, saying it was a secret. Even though I watched him make them, I could never figure out that secret ingredient. They were plump, cheesy and full of bacon and green onions; there was something different about this tater. I sought out to create my own version using sweet potatoes, and this recipe for Twice Baked Sweet Potatoes with Chipotle Cream was born. I can’t say we eat very many baked potatoes around our house, which is a shame. We eat potatoes but usually in different forms; soup, fried in duck fat, as a salad, gently boiled, you get the idea. We also love to eat sweet potatoes but not the sweet kind. They have to be savory. I needed something new and tasty (and gluten-free) to serve with a pork roast so I decided to try to create James’ famous twice baked potato using a sweet potato. First I baked the potatoes in a bed of kosher salt. I became a fan of baking my potatoes in kosher salt a few years ago. It creates a nice crisp skin and very moist flesh as well the flavor is really outstanding without being over salty. After I baked the potatoes, I scooped out their bright orange flesh and mixed it with some fried pancetta, sauteed green onions, a little butter and sour cream and a handful of freshly grated gouda. After re-baking the stuffed potato skins until warm, I topped each one with a slight dollop of chipotle sour cream. The spicy cream was a great companion to the salty pancetta and nutty gouda. It was a party in our mouths!! This is perfect with a roasted pork roast or a grilled steak, yet, it is filling enough to stand on its own. Heat oven to 400. Line a deep baking dish with foil. Fill with about halfway full with the salt. Bury the potatoes in the salt, cover with the remaining salt. Bake until soft inside, about 45 minutes to an hour, depending on the size of the potatoes. While the potatoes are cooking, cook the pancetta until golden. Add the green onions, stir and cook for about 3 minutes. Remove from the heat and set aside. Once the potatoes are cooked, remove from the oven. Let cool about 10 minutes. Slice in half. Gently remove the flesh, leaving a slight lining as to not go through the skin of the potato. Put the flesh into a mixing bowl. Mash with a fork. Add the pancetta mixture, butter and teaspoon of sour cream, stir until mixed. Season with salt. Stuff the skins with the mixture of sweet potatoes. Put the stuffed sweet potatoes onto a baking sheet covered with kosher salt (I used salt from the first baking) and slide into a 350 oven and cook until warmed throughout about 15 minutes. Remove from the oven, let cool for a couple minutes. Top with a spoonful of chipotle cream. Mix in a small bowl, let sit at room temperature until time to serve potatoes. 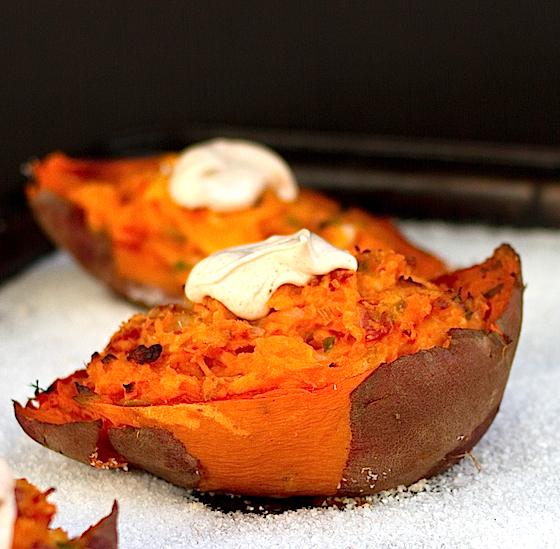 8 Responses to "Twice Baked Sweet Potatoes with Chipotle Cream"
omg, this looks just fabulous! i could never ever pass up a twice baked potato. Extra cheese and sour cream topping for me please. 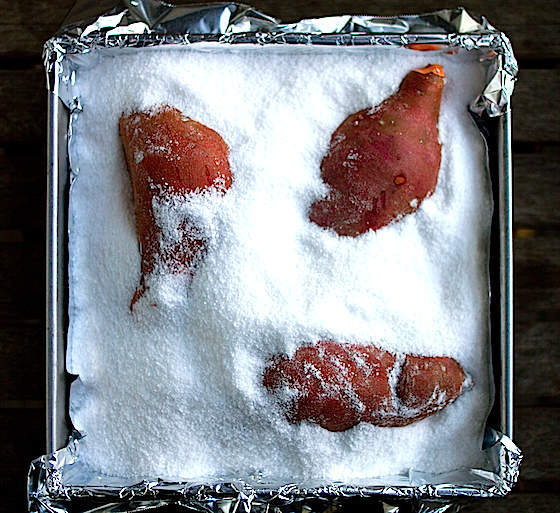 I'd love to try baking my potatoes in salt soon, thanks for the idea! Looks wonderful! I make a savory sweet potato puree from baked sweet potatoes which has minced chipotles en adobo mixed with some melted butter and a small amount of cream or half and half. This looks scrumptious! I too love sweet potatoes but hate that most recipes just make them sweeter (I'm still haunted by the sugary sweet potato mash with >gasp!< marshmallows all over it that my aunt used to make for Thanksgiving). Thanks for sharing a delectable savory recipe.. I'll be trying this out soon! Oh man, I love twice baked potatoes! I would definitely have a hard time passing this one up! I love adding ground chorizo to my sweet potatoes to make them "loaded" up! My husband would love these. He's obsessed with baked sweet potatoes. I'll have to try twice baked with this wonderful topping. The photos! You are just getting better. I have two big sweet potatoes sitting on my counter that are supposed to go in a soup, but you've got me thinking about an Indian inspired recipe that I adore. Lots of spices and plain yogurt so it is healthy! My CSA pickup today included six smaller sized sweet potatoes. Thank you! I now know what I am going to do with them.